Follow Cactus Gallery's board DOLLMAKERS III on Pinterest. 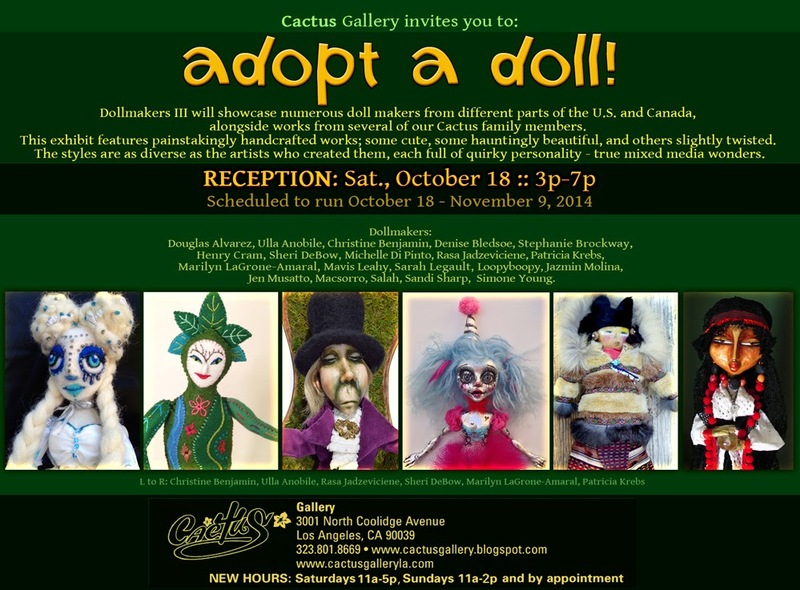 "Dollmakers III" will showcase numerous doll makers from different parts of the U.S. and Canada, alongside works from several of our Cactus family members. This exhibit features painstakingly handcrafted works; some cute, some hauntingly beautiful, and others slightly twisted. True mixed media wonders. For detail images of a doll or for purchase info, contact Sandra at semastroianni70@yahoo.com. 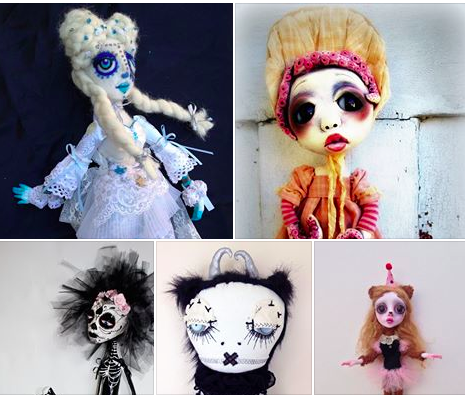 Dollmakers III will showcase numerous doll makers from different parts of the U.S. and Canada, alongside works from several of our Cactus family members. This exhibit features painstakingly handcrafted works; some cute, some hauntingly beautiful, and others slightly twisted. The styles are as diverse as the artists who created them, each full of quirky personality - true mixed media wonders. 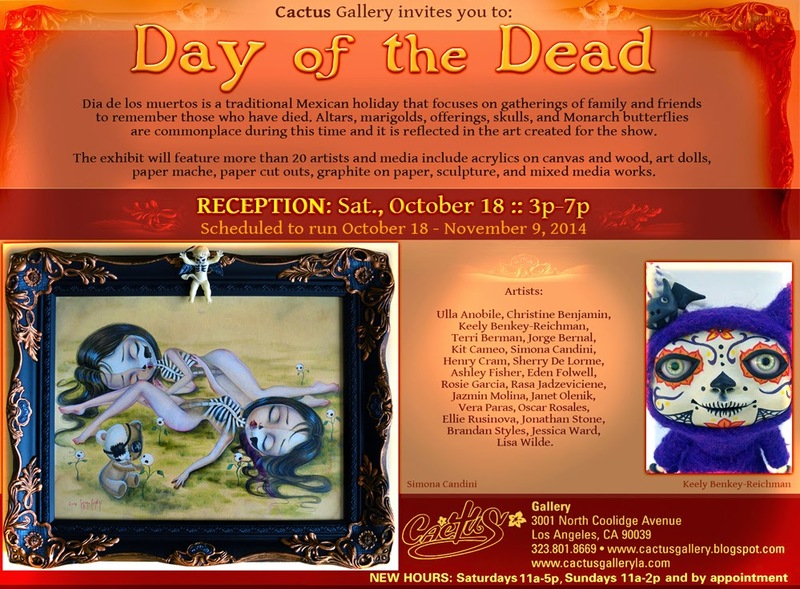 Follow Cactus Gallery's board Dia de los Muertos IX on Pinterest. Dia de los muertos is a traditional Mexican holiday that focuses on gatherings of family and friends to remember those who have died. Altars, marigolds, offerings, skulls, and Monarch butterflies are commonplace during this time and it is reflected in the art created for the show. More than 20 artists - acrylics on canvas and wood, art dolls, paper mache, paper cut outs, graphite on paper, sculpture, and mixed media works. Please join us in giving thanks for own lives and for those of who are no longer on Earth. Dia de los Muertos (Day of the Dead) is a traditional Mexican holiday that brings the advent of death to light, making the concept of "the end" less scary, and helping people feel a strong, healthy connection to the spirits of their loved ones. In order to honor and remember those who have died, we welcome you to bring your photographs and "ofrendas" (offerings) to add to our community altar. "Ofrendas" can be any thing that was important or special to the deceased, such as tools, awards, hats, etc... including favorite refreshments and foods. In Mexico, it is believed that the long hard journey from the afterlife back to Earth should rewarded with nourishment and refreshments for the returning souls. Our altar will include the presence of the four elements: water, earth, wind, and fire. No offering can be complete if one of those elements is missing, and their symbolic representation is a fundamental part of the offering. In addition, many cempazuchitl (marigold), called the flower of death, will be included, as the Aztecs believed that the strong scent could wake the souls of the dead and help guide them back for the celebration. 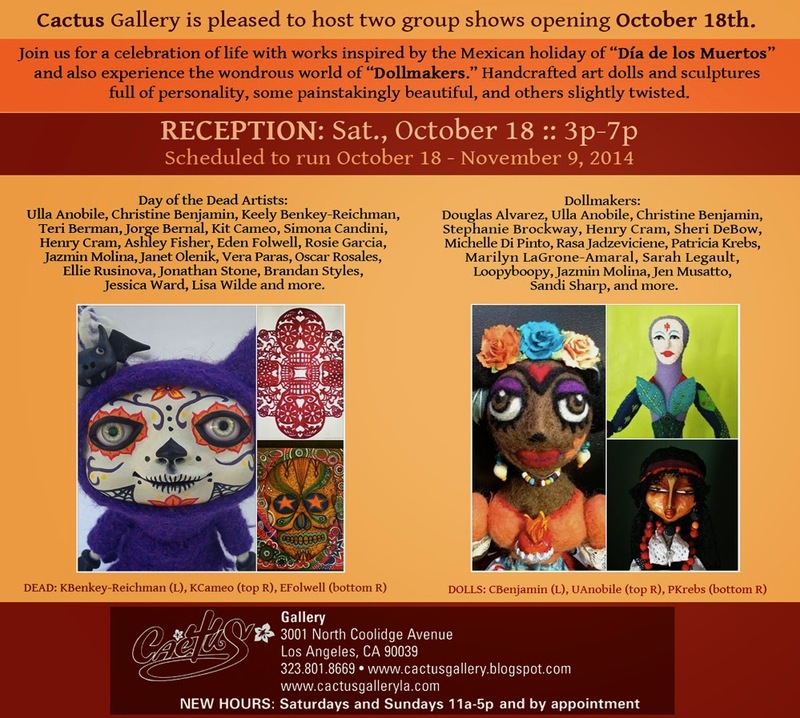 Cactus Gallery is pleased to present two of our most popular shows, the 9th Annual Dia de los muertos exhibit and Dollmakers III! Email Sandra at semastroianni70@yahoo.com or call 323.801.8669 for a visit or for purchase information. 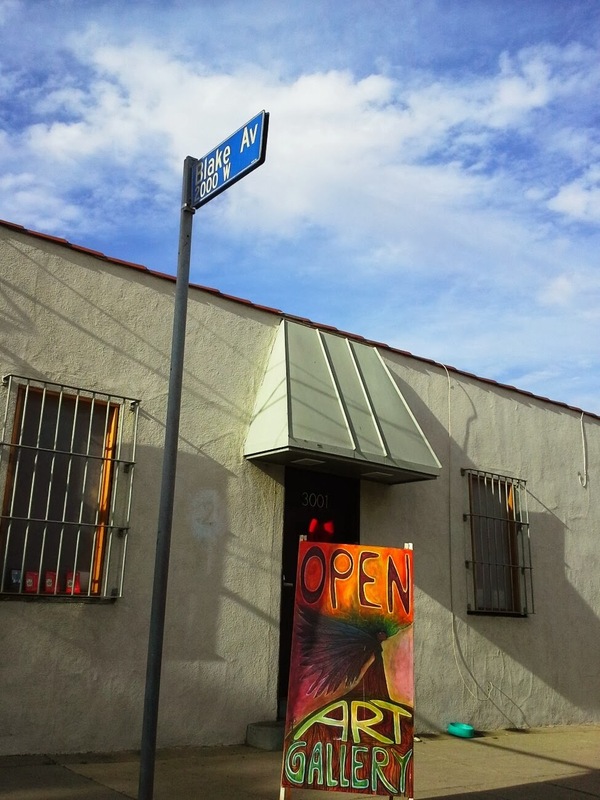 We accept all forms of payment and the gallery is open to installment plans to help you grow your collection. Dia de los muertos is a traditional Mexican holiday that focuses on gatherings of family and friends to remember those who have died. 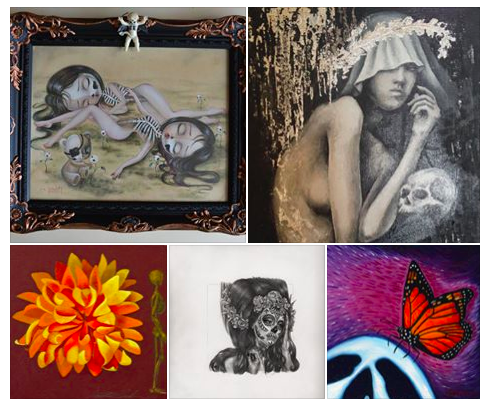 Altars, marigolds, offerings, skulls, and Monarch butterflies are commonly seen during this time and it is reflected in the art created for the show. The exhibit will feature more than 20 artists and media include acrylics on canvas and wood, art dolls, paper mache, paper cut outs, graphite on paper, sculpture, and mixed media works. Artwork above by Simona Candini, Rasa Jadzeviciene, Janet Olenik, Jessica Ward, and Rosie Garcia. For more on the show, to visit the gallery, or for pre-sale info, contact Sandra at semastroianni70@yahoo.com. Art dolls above by Christine Benjamin, Loopyboopy, Michelle Di Pinto, Jen Musatto, and Sheri De Bow. For more on the show, to visit the gallery, or for pre-sale info, contact Sandra at semastroianni70@yahoo.com.